This grinning Pirate skull still wears his scarf tied to one side and big loop earring on the other. His eye-patch is decorated with skull & cross-bones, and you can see his neck-bones at the back of his head. 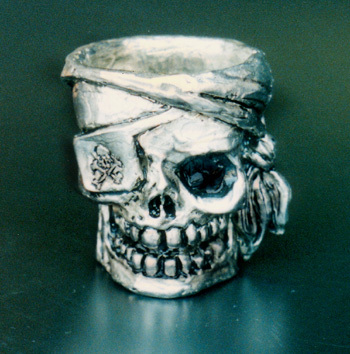 We make it by hand from safe lead-free pewter, and this Pirate Shot Glass will hold 1 1/4 ounces of your favorite drink. Strong enough for slamming down!